Government Watchdog Calls The Clinton Foundation "A Slush Fund"
It seems like the Clinton Foundation operates as a slush fund for the Clintons. When anyone contributes to the Clinton Foundation, it actually goes toward fat salaries, administrative bloat, and lavish travel. Between 2009 and 2012, the Clinton Foundation raised over $500 million dollars according to a review of IRS documents by The Federalist (2012, 2011, 2010, 2009, 2008). A measly 15 percent of that, or $75 million, went towards programmatic grants. More than $25 million went to fund travel expenses. Nearly $110 million went toward employee salaries and benefits. And a whopping $290 million during that period — nearly 60 percent of all money raised — was classified merely as “other expenses.” Official IRS forms do not list cigar or dry-cleaning expenses as a specific line item. The Clinton Foundation may well be saving lives, but it seems odd that the costs of so many life-saving activities would be classified by the organization itself as just random, miscellaneous expenses. In order for the 88 percent claim to be even remotely close to the truth, the words “directly” and “life-changing” have to mean something other than “directly” and “life-changing.” For example, the Clinton Foundation spent nearly $8.5 million–10 percent of all 2013 expenditures–on travel. Do plane tickets and hotel accommodations directly change lives? Nearly $4.8 million–5.6 percent of all expenditures–was spent on office supplies. Are ink cartridges and staplers “life-changing” commodities? But what if those employees and those IT costs and those travel expenses indirectly save lives, you might ask. Sure, it’s overhead, but what if it’s overhead in the service of a larger mission? Fair question. Even using the broadest definition of “program expenses” possible, however, the 88 percent claim is still false. How do we know? Because the IRS 990 forms submitted by the Clinton Foundation include a specific and detailed accounting of these programmatic expenses. 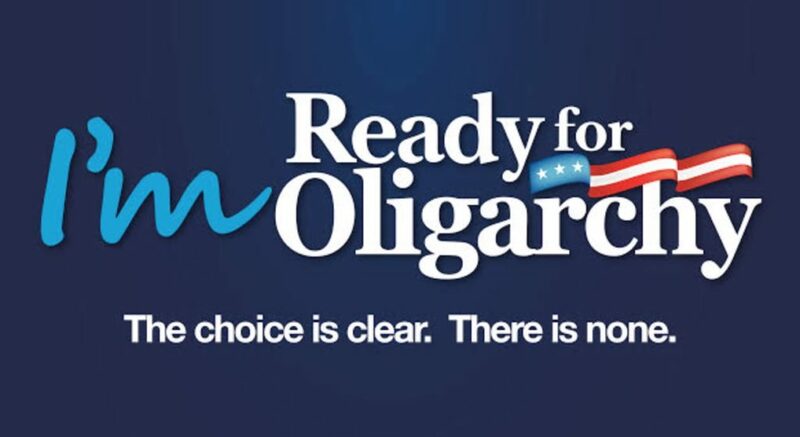 And even using extremely broad definitions–definitions that allow office supply, rent, travel, and IT costs to be counted as programmatic costs–the Clinton Foundation fails its own test. If you take a narrower, and more realistic, view of the tax-exempt group’s expenditures by excluding obvious overhead expenses and focusing on direct grants to charities and governments, the numbers look much worse. 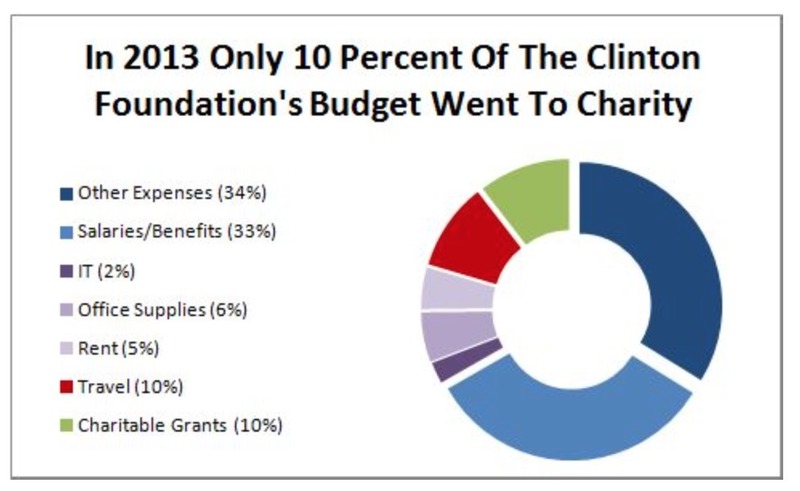 In 2013, for example, only 10 percent of the Clinton Foundation’s expenditures were for direct charitable grants. The amount it spent on charitable grants–$8.8 million–was dwarfed by the $17.2 million it cumulatively spent on travel, rent, and office supplies. Between 2011 and 2013, the organization spent only 9.9 percent of the $252 million it collected on direct charitable grants. While some may claim that the Clinton Foundation does its charity by itself, rather than outsourcing to other organizations in the form of grants, there appears to be little evidence of that activity in 2013. In 2008, for example, the Clinton Foundation spent nearly $100 million purchasing and distributing medicine and working with its care partners. In 2009, the organization spent $126 million on pharmaceutical and care partner expenses. By 2011, those activities were virtually non-existent. The group spent nothing on pharmaceutical expenses and only $1.2 million on care partner expenses. In 2012 and 2013, the Clinton Foundation spent $0. In just a few short years, the Clinton’s primary philanthropic project transitioned from a massive player in global pharmaceutical distribution to a bloated travel agency and conference organizing business that just happened to be tax-exempt.